Never tired of the road, Saxon announce the UK leg of their Sacrifice World Tour in support of the upcoming album of the same name. The New Wave of British Heavy Metal legends will play 9 dates in April 2013 and they can’t wait to share their new material on stage. Tickets go onsale at 9.00am on Friday 2nd November - full details below. 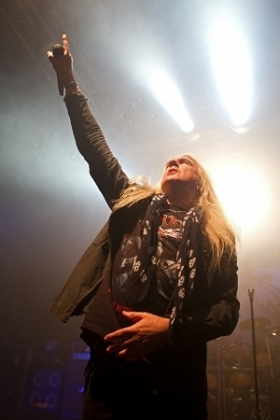 Throughout the years, Saxon have been touring relentlessly and earning an excellent reputation for the quality and energy of their performances. This is documented in their ‘Heavy Metal Thunder – The Movie’, which is released on 7th December. As UK fans await ‘Sacrifice’ with the same anticipation reserved for Saxon’s previous work, they know the spring shows will be - as always - a treat not to be missed.